The Smiths were a British alternative rock group from Manchester, England. Their career spanned 5 years from 1982-1987, and spawned 4 studio albums. 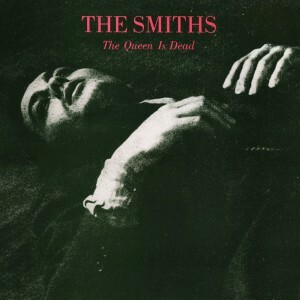 Their third album The Queen is Dead is a record that I have loved from the start. Every song on this album is stunning and has its own unique flair. In terms of its music, it is a phenomenal album. It’s surprisingly easy to listen to, and, in certain parts, it can even be referred to as hypnotic. Upon listening to this album, I noticed the range of musical influences, such as new wave (The Queen is Dead), punk (Frankly Mr. Shankly, especially lyrically), jangle pop (Cemetery Gates), balladry (I Know It’s Over, Never Had No One Ever), rockabilly (Vicar in a Tutu) and more. There is also a rhythmic quality to this album that makes it flow like water. Lyrically, this album is excellent, perfectly representing Morrissey’s unique lyrical style: darkly humorous, yet somewhat cryptic at the same time (“Sweetness, sweetness I was only joking/when I said I’d like to smash every tooth/in your head” [from Bigmouth Strikes Again] “but sometimes I feel more fulfilled/making Christmas cards for the mentally ill” [from Frankly [Mr. Shankly]). Although every song is excellent, the last two tracks – There is a Light That Never Goes Out followed by Some Girls Are Bigger Than Others – are especially memorable to me. They are respectively not only the darkest songs on the album, but also the best. Some Girls Are Bigger Than Others almost has a transcendental quality to it, and is arguably guitarist Johnny Marr’s finest hour. The spine-tingling flute section on the former track is one of the highlights of the entire album, as is the slide guitar part (by Morrissey, not Johnny Marr) found in the end. These “little things” are sprinkled throughout the whole album and are what makes this album truly special. Overall, this album is a classic. Its music and lyrics are fantastic and, after 25 years, it still sounds astonishingly fresh and relevant. It has influenced many great musicians in the Alternative Rock scene, from Oasis to Coldplay to Radiohead and beyond. It is also widely regarded as the greatest album by The Smiths, their crowning achievement. This has translated into commercial success. The album peaked at #2 on the U.K. Albums Chart, and stayed on the charts for 22 weeks. It has also hit #70 on the Billboard 200, has been certified Gold by the RIAA in late 1990, and has sold consistently well since then. Furthermore, in 2003, this album was ranked #216 on Rolling Stone magazine’s list of the 500 Greatest Albums of All Time. Although I would say that this is a must-have for alternative rock fans, I would also encourage anybody who has an interest in music to check out this, and their other, albums.